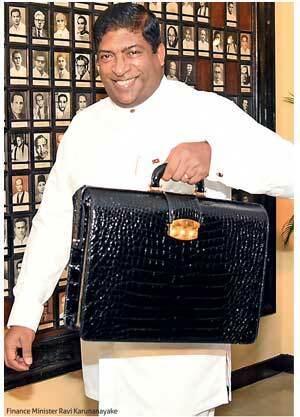 Finance Minister Ravi Karunanayake presented Sri Lanka’s national budget for 2017 in parliament on November 10, 2016. The Government of Sri Lanka (GoSL) expects to reach a fiscal deficit of 4.6 percent to gross domestic product (GDP) for 2017E (lowest since 1977, vs. 5.4 percent provisional in 2016). Furthermore, the GoSL expects to reduce its fiscal deficit to 3.7 percent in 2018E and 3.0 percent in 2020E. The GoSL expects to increase total revenue and grants to 15.5 percent of GDP for 2017E (vs. 13.5 percent in 2016) where tax revenue is forecast at 13.5 percent of GDP (vs. 11.6 percent in 2016). Major revenue raising propos also include Rs.32 billion from revision of corporate taxes, Rs.26 billion from revision of withholding taxes (WHT) and Rs.20 billion from transferring public institutions’ unutilized accumulated funds. 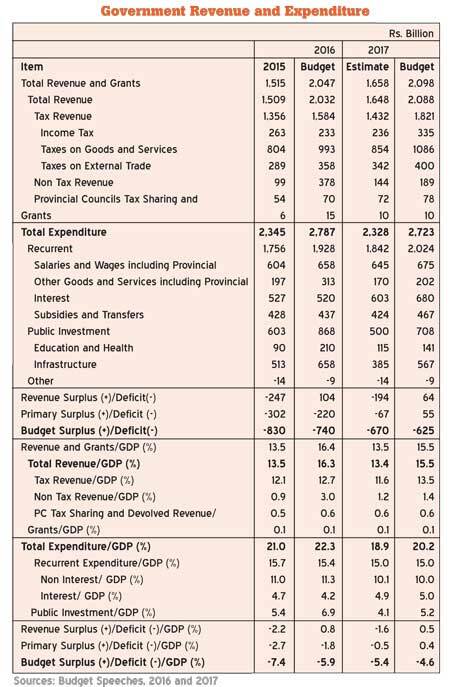 -Whilst 2017E revenue would largely be from indirect taxes, the finance minister stressed on improving the direct to indirect tax composition to 40 percent: 60 percent (from current 20 percent: 80 percent). Meanwhile, the GoSL estimates total expenditure at 20.2 percent of GDP for 2017E (vs. 18.9 percent in 2016E), with public investment expected to increase by Rs.208 billion to 5.2 percent of GDP and recurrent expenditure expected to increase by Rs.182 billion to 15.0 percent of GDP. Meanwhile, the GoSL expects 2017E debt to GDP ratio at 75.0 percent (vs. 75.8 percent in 2016E) and decline to 65.1 percent by 2020E, mainly on account of restructuring GoSL debt and sustainable improvement of the fiscal balance. Whilst expecting 6.0 percent GDP growth in 2017E, the GoSL expects GDP growth to increase to 7.0 percent during 2018-2020E, whilst average annual inflation is expected to remain subdued at ~4.0 percent. 2017E deficit is meanwhile expected to be largely financed via domestic sources, which is also aimed at reducing the total outflows from the country. Revise the corporate income tax rate to create a three-tier structure. -Standard rate of 28 percent will be applicable on the profits and income of all the other sectors including banking and finance, insurance, leasing, manufacturing and trading-related activities. -Income tax rate of 10 percent currently applicable on funds, dividends, treasury bills and bonds will be increased to 14 percent. -Remove the exemptions applicable on the income from the investment on listed securities, dividends, unit trusts and other instruments. Notional tax credit applicable on the secondary market transaction of securities also will be removed. Tax-free threshold on pay-as-you-earn (PAYE) tax will be increased from Rs.750,000 to Rs.1.2 million per annum. WHT on interest income will be increased to 5 percent from the present level VAT – exemptions. Clean energy, plant, machinery and accessories for renewable energy. Certain electrical and electronic goods. Introduce 100 percent capital allowances (200 percent if made in Northern Province) on investments greater than US $ 3 million with minimum 250 employment and US $ 5 to US $100 million with minimum 300 employment and be granted a tax credit (up to 5 percent of investment). Introduce specific tax concessions for investment between US $ 100 million to US $ 500 million with minimum employment of 500. Introduce concessions to exporters - rebate granted equal to 75 percent of the income tax of 2016/17, where profits from exports in foreign currency increased over 15 percent YoY. Revise capital allowances on plant, machinery or equipment from present rates of 33.3 percent, 50 percent and 100 percent to 20 percent (in five equal instalments). Reduce buildings allowance rate to 5 percent from 10 percent (i.e. to 20 equal instalments). Commence operations of an EXIM Bank during 2017 with an initial capital of Rs.25 billion, a collaboration between the government (Rs.10 billion) and the industry (Rs.15 billion). Increase the minimum capital of licensed commercial banks (LCBs) to Rs.20 billion (from Rs.10 billion), licensed specialized banks (LSBs) to Rs.7.5 billion and primary dealers (PDs) to Rs.1.5 billion. Amalgamate HDFC Bank and State Mortgage and Investment Bank (SMIB) to create ‘Housing Bank’ – by allocating Rs.7.5 billion. Direct banks to ensure that at least 10 percent of their lending portfolio is for agriculture, 10 percent for SME, 10 percent for exports, 10 percent for tourism, 5 percent for youth and 5 percent for women. Introduce financial transactions levy (FTL) at the rate of Rs.5 per Rs.10,000 on the total cash transactions including EZ cash by banks and other financial institutions. Impose a fee of 2 percent on cash transactions above Rs.5 million - not applicable on any transaction carried out through the banking channels including through cheques, telegraphic transfers, bank drafts, etc. Limit loan-to-value ratio (LTV) for vehicle categories as follows: three-wheelers 25 percent, motorcars and vans 50 percent, commercial vehicles (lorries and heavy vehicles) 90 percent. -listed companies likely to have a potential impact: all listed LCBs, NBFIs and other licensed financial institutions. Increase telecommunication levy on Internet services to 25 percent, on par with the other telecommunication services. Increase annual spectrum licence fee (ASLF) by 25 percent w.e.f. January 1, 2017. Provide all mobile telephone operators a six-month period to convert their infrastructure to provide at least 3G coverage - any operator who fails to implement will be liable for a surcharge of Rs.100 million per district. Convert all metro to 4G by June 30, 2018. Introduce SIM card activation levy (SCAL) of Rs.200 per SIM – to generate Rs.200 million. Exempt the services provided by the external gateway operators to local operators from VAT and nation building tax (NBT). Impose FTL at the rate of Rs.5 per Rs.10,000 on the total cash transactions including EZ cash by banks and other financial institutions. -Listed companies likely to have a potential impact: Dialog Axiata (DIAL), Sri Lanka Telecom (SLTL). Assist refurbishment of hotels which have been in operation for more than 10 years by providing an interest subsidy, allocate Rs.500 million. Provide a common technology platform for the country’s lodging businesses to compete with Airbnb, Agoda. Impose a 0.5 percent tourism development levy on businesses with revenue of less than Rs.12 million per annum. 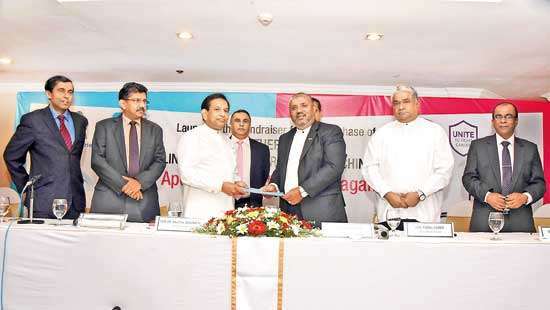 Construct a MICE Convention Centre in Colombo with a seating capacity of 5,000, to be completed by 2019. Terminate minimum room rate regime by 2018. Increase the embarkation levy (EL) to US $ 50 per passenger from US $ 30. -Listed companies likely to have a potential impact: all listed tourism companies. Request Ceylon Tobacco Company (CTC) to donate Rs.500 million to the Presidential Fund to be utilized for the anti-smoking campaign. Issue licences to import beedi leaves by charging an annual licence fee of Rs.5 million. -Listed companies likely to have a potential impact: Ceylon Tobacco Company (CTC). Implement the fool proofs ticker system proposed in budget 2016 in 2017. Reduce the evaporation allowance of ethanol for the production of liquor from 1.5 percent to 0.1 5 percent. Increase the customs duty on imported ethanol by 5 percent. Introduce excise duty of Rs.25/litre for imported non-potable liquor. Increase custom duty on importation of potable alcohol from Rs.500 to Rs.800 per litre. Introduce excise duty on the importation of beer can at Rs.10 per cannot more than 325ml and Rs.15 per can of more than 325ml. Impose excise duty on molasses (Rs.20/lt), coconut toddy (Rs.10/lt), maize (Rs.20/kg), rice (Rs.20/kg) used for manufacture of ethanol. -Listed companies likely to have a potential impact: Distilleries Co. of Sri Lanka (DIST), Lion Brewery Ceylon (LION). Remove the cess of 25 percent, which is applicable on pre-fabricated structures. Grant a 75 percent waiver on PAL when importing high-tech, automated machinery and equipment. NBT exemption will be removed from construction services, including the services of sub-contractors. -Listed companies likely to have a potential impact: Access Engineering (AEL), MTD Walkers (KAPI). Form a textile cluster including sizing, dyeing and finishing units by the private sector, with the support of the government. This venture is estimated to save at least US $ 2 billion per annum. -Listed companies likely to have a potential impact: Textured Jersey Lanka (TJL), Hayleys Fabric (MGT). Remove freehold right restrictions from the ground floor and allow foreigners who will be purchasing condominiums to raise 40 percent of the cost from a domestic bank. -However, such debt servicing should be in foreign currency. Remove NBT on sale of residential apartments. Impose capital gains tax of 10 percent on the gain realized from disposal of immovable properties w.e.f. January 1, 2017. -Listed companies likely to have a potential impact: John Keells Holdings (JKH), Overseas Realty (OSEA). Complete Central Expressway at an investment of ~US $ 6 billion by 2019. 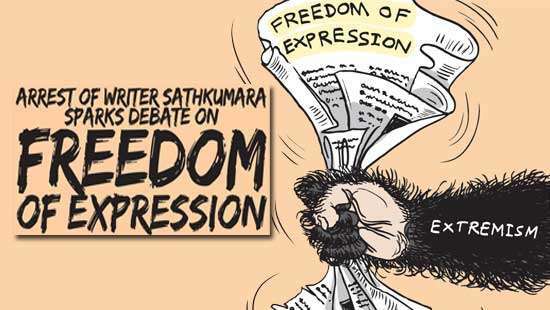 Extend the Katunayake Expressway, Southern Expressway and Outer Circular Road. Elevated highways connecting the new Kelani Bridge to Athurugiriya and Kelani Bridge to the port area in 2017. Introduce a Light Rail Transit (LRT) system on identified seven corridors in the Western Region. Repeal Exchange Control Act and introduce a Foreign Exchange Act to protect foreign reserves from irregular transactions. Introduce an Investment Inflow Management Act to facilitate the inward remittance of foreign exchange with minimal restrictions. Increase foreign currency declaration threshold from US $ 15,000 to US $ 40,000 from current lubricants. Revise biannual registration fee from Rs.2 million to Rs.2.5 million or 0.75 percent of total invoiced sales whichever is higher w.e.f. January 1, 2017. -Listed companies likely to have a potential impact: Chevron Lubricants Lanka (LLUB), Lanka IOC (LIOC). Extend the engine capacity-based excise duty on motorcycles. Reduce excise duty on electric cars with motor power less than 100 KW. Extend the age limit for importing lorries and refrigerated trucks of capacity over five metric tonne to 10 years. -Listed companies likely to have a potential impact: All listed motor companies. Impose a minimum price of Rs.5,000/MT for sugarcane w.e.f. January 1, 2017 to encourage local cultivation. 100 percent capital allowance on industry investments. Impose a 2 percent cess on imported sugar. -Listed companies likely to have a potential impact: Ceylon Cold Stores (CCS), Cargills (Ceylon) (CARG), Nestle Lanka (NEST). Allocate Rs.400 million to promote domestic milk production via import substitution. Import 15,000 high milk-producing cattle. Custom duty on import of milk powder will be reduced by Rs.35/kg to Rs.100/kg. Exempt VAT on locally manufactured dairy products other than milk powder yet continue to sell 400g of locally produced milk powder at Rs.295 (amid potential government subsidy). 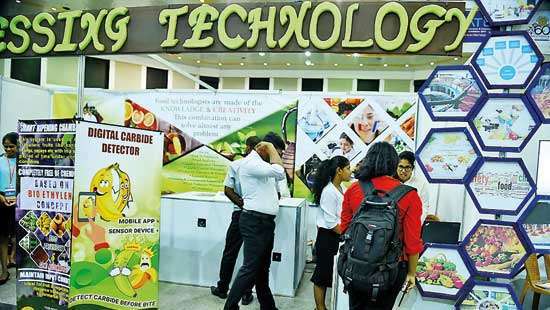 -Listed companies likely to have a potential impact: Cargills (Ceylon) (CARG), Kotmale Holdings (LAMB), Lanka Milk Foods (LMF), Nestle Lanka (NEST). Reimburse import cess on maize as an export rebate on the export of chicken. Relax the maximum retail price of Rs.420/kg on whole chicken. -Listed companies likely to have a potential impact: Bairaha Farms (BFL), Ceylon Grain Elevators (GRAN), Three Acre Farms (TAFL). Encourage adoption of the out-grower model of ‘small producer – large purchaser’. Restrict maximum acreage that can be held by any standalone company to 5,000 acres. Develop an automated commodity exchange. -Listed companies likely to have a potential impact: All listed plantation companies. Increase tea export earnings to US $ 5 billion by 2020. Simplify tax and fee structure: abolish the import and export control fee of one percent on CIF price of tea, remove fee on packaging, remove fee on logo registration and simplify the annual renewal of licences. Encourage import of cut, tear and curl (CTC) teas for re-export with value addition. Ban the export of refuse tea: impose a fine of Rs.300/kg. -Listed companies likely to have a potential impact: All listed tea plantation companies. Allocate Rs.900 million for replanting of rubber. -Listed companies likely to have a potential impact: All listed rubber plantation companies.